Giovanni Colacicchi (Anagni/FR 1900 - Florence 1992). Biography. Born into a traditional catholic family, Giovanni Colacicchi began his studies in the seminary. At the end of the first World War, he moved to Florence, where he studied the first Renaissance painting, devoting himself at the same time to poetry. 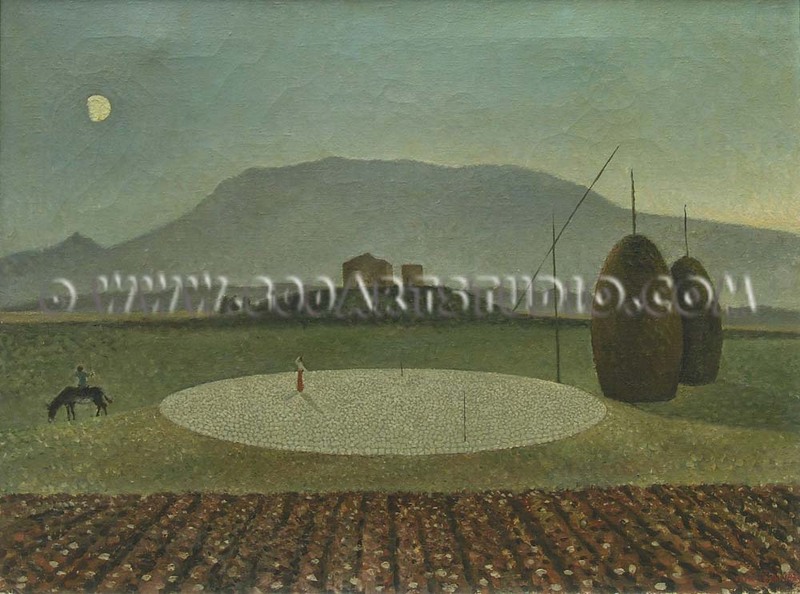 Around 1919, he began to take an interest in the landscape painting, which was a favourite subject of the Tuscan artistic circles of the period. 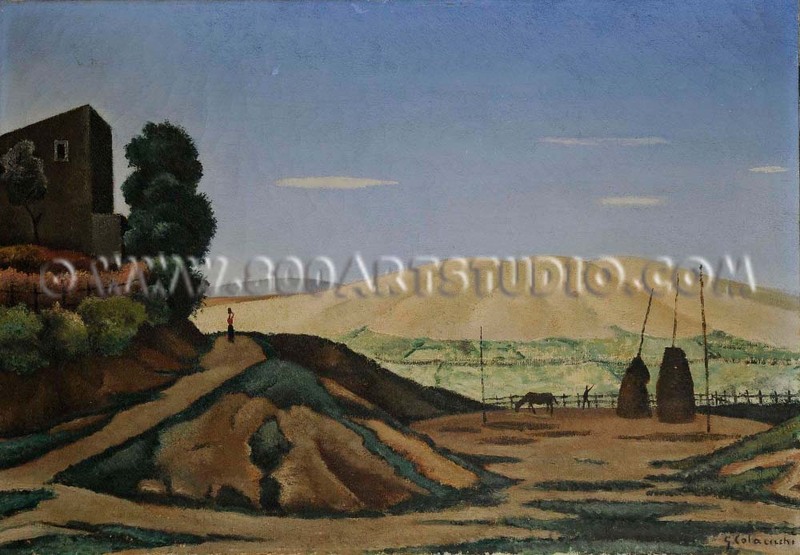 After 1920 he decided to concentrate only on painting. During this period he was well introduced in the cultural circles which frequented the Caffé delle Giubbe Rosse, where he became friend with Aldo Palazzeschi, Libero Andreotti, Raffaello Franchi and met his master, the painter Francesco Franchetti. 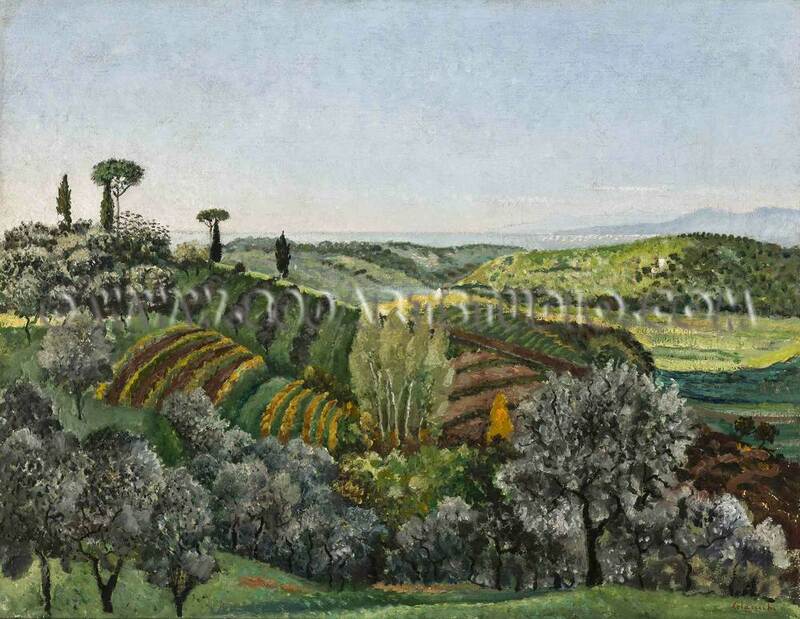 Through Geraldo Cepparelli, whose study in San Gimignano he frequented regularly, he met Raffaele De Grada, who was trying in that period to get over the Macchiaioli and Impressionist legacy working out a firm and solid image of the landscape, taking example from Cézanne. 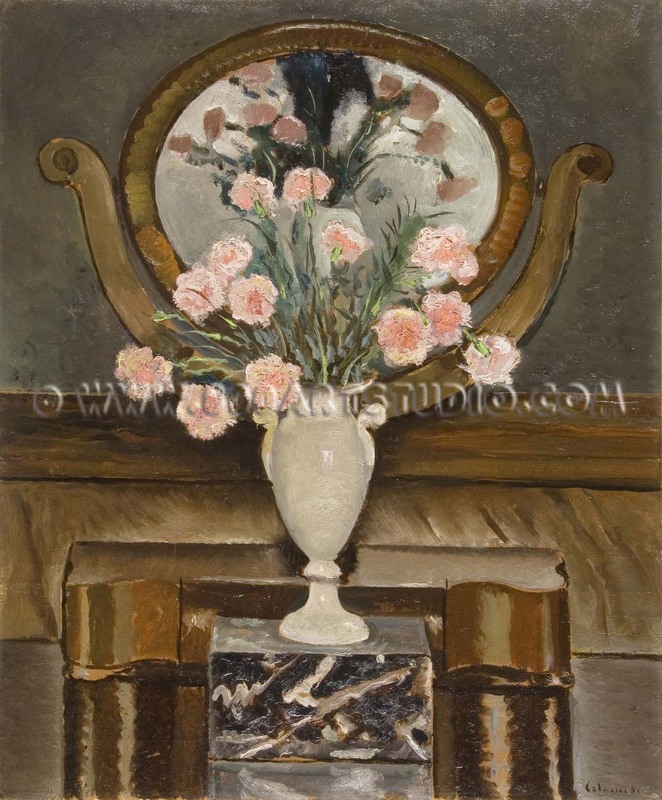 It was in the Roman study of Carlo Socrate in 1921 that he met another fundamental artist for his development, Onofrio Martinelli, to whom he remained deeply attached for the rest of his life. During these first twenties, in Florence, he dealt with the climate of the return to order also through the Plastic Values Collective, organized within the Florentine Primaverile of 1922; in 1926 he was among the founders of Solaria, magazine of art and literature. The Italian intellectual élite took part in it from Giuseppe Ungaretti to Eugenio Montale and Carlo Emilio Gadda, as well as the group of Tuscan artists, made up, among the others, of Baccio Maria Bacci, Italo Griselli, Gianni Vagnetti, Onofrio Martinelli. During the same year Colacicchi exhibited his works at the First Show of the Italian Novecento and, later, at the exhibitions organized by Margherita Sarfatti abroad. In 1930 the Saletta Fantini of Florence presented the first personal exhibition of Colacicchi who in the same year painted the “Donna di Anagni” (Woman of Anagni), one of his first important works, which was presented at the first Roman Quadriennale. The critic Raffaello Franchi saw in it an homage to the monumentality of the Tuscan Quattrocento. 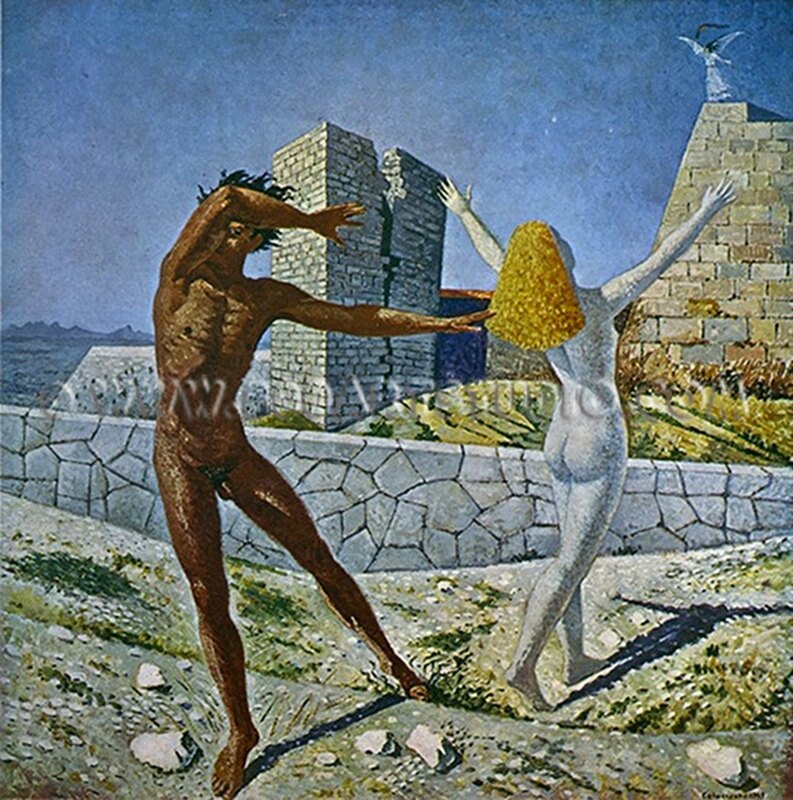 Between 1931 and 1933 he passed long periods in Anagni, where he painted works such as “Santa Maria Egiziaca” (Saint Mary Egyptian) and “Giacobbe e l’Angelo” (Jacob and the angel) and in 1932 he took part in the Venetian Biennale with a personal hall. In the same period, getting over any remaining naturalistic fragmentariness and casuality, he retrieved the examples of the great Italian painting, from Giotto to Andrea del Castagno and Piero della Francesca. During the autumn of 1935, following a sentimental crisis, he went to South Afrika, staying one year in Cape Town, where he painted works such as “Gli esuli” (The exiles), “Il faro di Mouillepoint” (The lighthouse of Mouillepoint), “Saldhana Bay”. In 1937, in Rome, he got in touch with Libero De Libero, director of La Cometa Gallery, meeting point of the painters of the Roman School; the following year, he moved to the capital with his companion, Flavia Arlotta, and his newborn baby and held a personal show at La Cometa, which collected his recent works, among these some still life paintings marked by a metaphysics atmosphere. In the same period he obtained the chair of Decoration at the Fine Art Academy of Florence, where he will teach until 1970. Back in Florence in 1939, he worked on a painting for the Law Courts of Milan and prepared a series of still life paintings which were exhibited in 1940 at the Florentine Lyceum show, during which he met the American art historian Bernard Berenson, who he will frequently saw until the death of the expert in 1959. After the war – he was a member of the Action Party – Colacicchi continued consistently his pictorial research founding in 1947 the group Nuovo Umanesimo, together with Oscar Gallo, Quinto Martini, Onofrio Martinelli, Ugo Capocchini and Emanuele Cavalli, with the intention to support, in dispute with the abstract tendencies, the figurativeness and the realism in painting and sculpture. In 1948 he participated for the last time in the Venetian Biennale with “Il martire e La martire” (The martyr). In the following years Colacicchi’s artistic research continued in a consistent and secluded way, while his public activity got more intense, with personal shows and the realization of some decorative cycles, as well as with his activity of art critic for the newspaper La Nazione and of director of the Accademia.